Well, a few folks knew the word "peckish." One dictionary I have lists the word; another one doesn't. It means "hungry" and is identified as "chiefly British." I suppose it's one more of those old English words that has survived on Ocracoke for many a generation. Even on the island it is no longer a word commonly heard. Nevertheless most native islanders know the word, even if it is seldom used today. I am giving the journal entry position back to Jude for a while. She still needs to give you that information she promised you -- about the storm of '44. I am getting ready to spend a couple of days hiking in the mountains of Tennessee so I'd better start getting ready. My friend Jim will be hanging out at my place while I'm gone, ready to report to me how wonderful the weather is on the island while I am away (this afternoon the beach was super -- sunny, blue skies, and warm, warm water....ahhh). It's difficult to think about leaving! That's what Dale said he was yesterday afternoon. We wonder if any of our readers know what Dale was talking about? Please post a comment if you know what the word means (no fair if you have to look it up). And let us know where you're from and how you know the word. Many of our readers are aware that the Community Store, a landmark business on Silver Lake Harbor, closed its doors this Spring after eight-eight years of continuous operation. It was a great loss to our close-knit village. Residents and visitors alike were delighted to learn recently that islanders, Rob Temple & Sundae Horn, will be reopening this traditional general store the middle of next month. We will have more news of the store in the future. We have also published our most recent Ocracoke Newsletter, a tribute to the Community Store and the many other small general stores that served Ocracoke Island since the 1700s. You can read the entire newsletter by clicking here. ....deviled eggs, salads, macaroni, fresh clams, chocolate cake, and more. These were just a few of the dishes folks brought by this past Saturday night for our potluck dinner on the first day of autumn. Although the day had been warming up, I left the windows and doors open. As soon as the sun set a cool breeze wafted through the house and everyone was comfortable. After dinner talk turned to feats of physical dexterity. To everyone's amusement, before long folks were grabbing one of their big toes and jumping over their arm with the other leg...or doing "monkey rolls" across the living room carpet...or twisting themselves into pretzel shapes while holding on to a broom. Well, we ancient ones might have tried one of these tricks, but soon decided that a pulled muscle was just not worth it. (Actually, to be fair, Captain Rob did do a couple of monkey rolls with his nephew, Charles.) The younger folks even found some of the tricks a bit challenging, but with practice managed to master them. Lucky for me my liability insurance was paid up! We passed on standing eggs on their ends. On September 26, 1894 the two masted schooner, A.P. Richardson, was stranded on Ocracoke's beach just one half mile south of Hatteras Inlet. The "sea was very high," and a "strong gale" was blowing, along with heavy rain. According to keeper James W. Howard of the Life Saving Station, the sand was "blowing almost putting our eyes out." When the station crew arrived, the wreck was reported to be "high on the beach" but still surrounded by a raging surf. One of the surfmen waded out into the turbulence as far as he dared and threw the heaving stick on board the schooner. The heaving stick is a wooden wand about eighteen inches long with a heavy ball of lead on one end. The other end is fastened to a light weight "whip line." On this occasion the whip line was sent on board doubled and the five crewmen were hauled to shore with it, one at a time. The ship's captain and his crew, all from Long Island, were given dry clothes and made comfortable at the station. The schooner was a total loss. Earlier this month Lou Ann & I took a trip to the Upper Penninsula of Michigan. We ventured as far north as Whitefish Point and toured an old Life Saving Station there on Lake Superior. It was fascinating to learn how the lives of the crew members and their families were similar to (and different from) the lives of the surfmen on the Outer Banks. On the way back we parked our car and boarded the ferry to Mackinac (pronounced "Mackinaw") Island. We stayed several days and enjoyed seeing another island community. Although much like Ocracoke in many ways, there are considerable differences. Mackinac has no ocean beach, of course, and the water there is much colder. They have a larger tourist industry (though a shorter season), and many fine old Victorian homes with beautifully manicured lawns and gardens. Many of these "mansions" are private vacation homes belonging to wealthy business men and women. There is also an impressive old hotel, the Grand Hotel, that dominates the view from the water, and an historic revolutionary era fort full of history. One of the most striking differences is the absence of motorized vehicles on Mackinac. In 1911, with only a handful of automobiles on the island, a Model T Ford backfired and spooked a horse. The horse bolted and ran over a group of schoolchildren, killing seventeen. Soon afterwards an ordinance was passed banning all motorized vehicles. The island is now dominated by pedestrians, bicycles, and several hundred draft horses pulling wagons, carriages, and drays. Mackinac is a lovely island, full of history and beauty, but I believe I'll stay put, right here in my little corner of paradise. Ninety-three years ago yesterday Augustus Abner McGuire, an Irish seaman, died from an accident at sea and was buried on Ocracoke Island. His ghost has haunted the village since that time. You can read his story here: Old Diver. In other news, today is shaping up to be one more beautiful fall day on Ocracoke. In spite of a slight breeze & a few scattered clouds I am looking forward to enjoying a stroll along the beach later on. Apparently distant hurricane Helene is still causing high tides, large swells, and some rip currents so I may forego swimming. ....and equal day. Today is the fall equinox, the official first day of autumn. Equinox literally means "equal night." The night is the same length as the day, twelve hours each. And what a wonderful day this is already. Like yesterday and the day before we're expecting warm days and cool nights. The ocean temperature is just right. Hurricane Helene (way out in the Atlantic) is causing some higher than normal tides and the risk of rip currents, but with prudence folks have still been enjoying the water. On the spur of the moment yesterday (as I was on the schooner, Windfall, with Captain Rob) we decided to have an equinox pot luck dinner tonight. Come on by, the food will be delicious, and the good will will be infectious. Hi. This is Philip back. As many readers have undoubtedly figured out, I was off-island for a week or so. While I was gone Jude kept up with the journal. And she did a great job, didn't she! While I was away I'd check the journal just to see what was going on back home. Jude even continued to write after I returned. I thought maybe I wouldn't get my job back. But now Jude is taking a vacation (this is the time of year we do this, though we often hate leaving Ocracoke during the glorious fall weather!). So I'm back at the computer, posting island news. I want to share some thoughts about my trip, but I'll do that in a day or so. Right now I want to answer a couple of questions we received while I was away. A reader asked the following question after my post about the creepy after-dark walk through the "woods" to my office. I mentioned that Euphemia Curtis is buried just outside my back door, and that I pass her gravestone on my walk. "How did poor Euphemia end up only 10 feet from the back door?" the reader asked. Well, there are more than 80 cemeteries on the island. They are scattered all over -- along main roads & Howard Street, in back yards, on tussocks here and there, in the woods, and along the sound shore. These are just the graves that are marked and identified. Many of the older wooden markers have rotted away and the graves have been covered over with bushes and trees. Some graves along the shoreline have eroded away. I've even heard tales of at least one person who discovered an old marker lying in the water, under the sand. Then there are the graves that were never marked -- slaves and others without the means to purchase a stone. And don't forget the hundreds of hapless sailors & passengers on wrecked sailboats & steamers who were buried in unmarked graves in the dunes along the ocean (never thought about that when you were lying in the summer sun, did you?). Anyway, Euphemia was buried on my property in 1882. She lived in the old house that sat where Natural Selections is today. When I purchased the land in the early 1970s (it had been my great-aunt Tressie's garden) it was completely covered with bushes and weeds, and I had no idea there was a grave there. We built the Village Craftsmen in 1973-74 -- we hope with Euphemia's blessing. As I mentioned, she lies just beyond the back door, and is a distant relative, so she's become a neighbor of sorts. Who knows, there might be other graves nearby, but her's has the only marker. So far, they've all been civil to me. I'll let you know if Euphemia or her relatives ever start playing pranks. My apologies to everyone who enjoyed checking on the free items. I decided to eliminate that page for one reason only. This web site is a lot of work. Just writing the daily journal entry can be quite time consuming. And the monthly newsletter is even more work. I often do a lot of research -- in books, notes, and interviews with neighbors. As a result, we are way behind in updating our on-line catalog. We have a lot of new items we want to add to our web site, and we'd like to update many of our photos. We're hoping we can do some of that work now that the season is slowing down a bit. There just wasn't enough time to choose a new free item each month, photograph it, manipulate the photo, add it to our site, monitor the phone, then revise the web page when the item was claimed, etc., etc. We hope you understand. Well, I suppose it's time for me to end this rambling post. It's good to be back home (though I miss spending time with Lou Ann, of course!). So I'll share more news with you in the days ahead. Thanks for reading our Ocracoke Journal! Oprah What Have You Done ? Well, yesterday was another one of those " can't catch a breath " days. The Oprah Show had the Food Channels' Rachael Ray on last week. 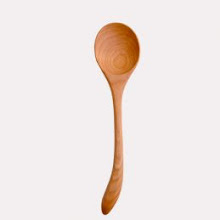 It was a repeat of a show from the spring and Rachael showed the" Lazy Spoon" by Jonathan Spoons on the show. We carry Jonathan Spoons in the shop and the day after the show aired the proverbial " you know what " hit the fan! This is not a complaint. I've been packing those devils up as fast as I can and shipping them off with Grant our" Woo- hoo" UPS man. (And I do mean woo-hoo girls ). Whew, I need a vacation! That's exactly what I intend to take come Friday when Frank and I will be going to Murphy, NC. We've rented a log cabin and our son Travis, daughter-in-law April and grandaughter Ava will be meeting us there. I don't intend to do a thing but hug my babies, laugh and swim. Tell you about it when I get back. Dale was mowing the lawn this morning when he called to remind me what happened three years ago today. I didn't need reminding. Not many of us that live on Ocracoke and Hatteras do. Izabelle happened. This past weekend was good enough to be bottled and sold! We all work such long hours duing the season that I believe these glorious end of summer, early autumn days are given to us especially as a gift. They are just for us, to clear our heads, fill our lungs and hearts and ease our weary bones. We went to the beach where Willy our Corgi enjoyed the waves and Lici our eight year old grandaughter built another sand castle and collected more shells for necklaces. Dale, Jaren, Frank and I watched the fishermen and just enjoyed being. Some dear souls tried driving their little sedan onto the beach and it sank like a rock in the sand. I can't imagine what they were thinking. A couple of local fellows stopped ( one of them was my son Matt) and pulled the visitors car off of the beach. I hope they leave with a good memory of Ocracoke and her people. Yesterday Dale reminded me that it was the 62nd anniversary of the "Hurricane of '44". The evening before ,Aycock Brown warned of the impending storm so it's told. Dale says his Granny remembered that evening as being particularly beautiful. The next morning one of the worst hurricanes ever to hit the east coast struck witha fury! Only five houses on Ocracoke escaped flooding. The Pamlico Inn was almost entirely washed away as were a number of homes. The mailboat was washed up right about where Ride the Wind is now. We've been very lucky this year. No storms so far and none brewing that we know. This summer has provided plentiful rain and the island is lush and green. It's a grand time to visit. Some of the stories Dale told me of the '44 storm were so interesting we'll have to pass them along to you...........next week. Yesterday I had fun. Usually I work in the "back" and don't have the opportunity to meet visitors to the shop unless there is a question or a problem and I'm called upon. I have an office behind the scenes where I do the buying, take care of the mailorders and pay the bills etc. If you call Village Craftsmen during the week chances are you'll speak with me. I really enjoy what I do. Besides, I think Philip is a little hesitant to have me out front because I'm not always what one would call" politically correct". MMMM? He's probably right. But yesterday Dallie was off, I had Dale in the back opening merchandise and I was to the counter! Ha! The folks who came in were delightful, we kidded and laughed and I even sold a few things. And just in case Philip reads this....... I don't believe I offended a single person! Florence didn't come anywhere near Ocracoke but as Atlantic storms so often do, she broke the back of summer. The past three days have been cool and windy. Frank and I went to the beach after work last evening. Low clouds were rushing across the sky and the sunset was breathtaking. The ocean was very angry. Huge swells were coming in from the southeast but the northeast wind was strong and was blowing the tops off of them. We felt like we were witnessing an immense struggle with no clear winner. The wildness of the weather here is exhilerating. Perhaps that is one of the reasons we who live here, live here. We've been able to observe terrapin habits for many years now. The turtles appear in late March or early April, many years coming on the first day of spring, as if they knew. They go into hibernation in late October or early November depending on how warm the water stays. I feed them Purina Cat Chow. Mind you, it's just dessert. They've been snacking on Fiddler crabs and other such delicacies all day long. The few times I've given them other brands of cat food they have protested either by not eating it or even worse, by giving me the "stink eye"! Many folks have come to the house to feed the turtles. Family, friends, Closed Today Theater attendees and especially children love to feed them or watch them be fed. When the tide is low I put the food on the mud so the turtles have to come out of the water to get it. That way I can get a better look at their markings. It's then that my cats get curious about who is eating their food. We've had many a laugh as the cats sneak up on the turtles, the turtles scurry quickly back to the water only to stop , regain their composure and come racing ( a relative term) back to charge the cats. The cats then whack them in the head, the head retreats and the turtles wait for the cats to get bored which we all know cats do rather easily. The cats move off to other adventures or misadventures and the turtles have dessert. No one gets hurt and over the years it seems to have turned into a game that both enjoy or at least tolerate . It's been such a busy day here at Village Craftsmen that I haven't had the opportunity to finish my tale of the turtle but will on Monday. Unlike Philip...... I WORK here. ( Oh boy, he's going to love that one )! Ya'll have a wonderful weekend. Labor Day Weekend is not as busy a time on Ocracoke as one might think. Families are busy getting children ready to begin another year of school or the children have already begun classes and Ocracoke is a "fer piece" to come for a weekend. But the weekend was beautiful, sunny and quiet, temperatures in the low 80's, soft breeze. Sorry ya'll weren't here. We did enjoy it. Today we have a front moving through and we've had lovely rain since midmorning. Seems like a perfect day to read a book or, heaven forbid, take a nap. Ocracoke lost a friend and neighbor last week. Danny Gaskill, only 42 years old, died suddenly at home. Everyone agreed that Danny was a wonderful person. He loved to hunt and fish, and was happiest when he was out on the water or in a field on the mainland, often with family and friends. The church was packed this afternoon as folks came to pay their respects. Afterwards at his home different people remembered Danny's good nature, his winning smile, his witty sense of humor, his love of history, and the especially close bonds he had with his wife, Cindy, and their two children, Katelynn and Crissy, and with his mother & father, Alda Van & Bill. If you are a visitor to the island you may have known Danny as the face behind the seafood counter at Dolphin Cove on Highway 12. We will all miss Danny. That's all it is -- 25 paces, about 75 feet -- along the path from my house to my office. But it's dark and creepy at night, and especially haunting when the moon is "shining like the devil's eye." The path twists and turns, and tree branches loom out of the darkness like gnarled arms of a skinny old woman. Spider webs lace the path and roots reach up to snag my feet. I'm happy to reach the door, turn the key, and step inside -- only to be met by eerie, silent darkness. Then I remember. Not more than ten feet from the back door lies Euphemia Curtis, dead for more than 100 years. My eyes adjust. I look around and listen, then turn on the lights. I am alone. I settle down to write. Euphemia never bothers me. She is a good neighbor. The wind picked up last night, but I slept soundly as usual. It must have rained a good bit, too. This morning the winds are steady at around 20 - 30 mph, with higher gusts. No tide that I am aware of. There is something distinctive about a tropical storm. Don't know exactly what it is. Skies are gray and overcast. That's not unusual. The trees are swaying back and forth. We see that a lot here on the Outer Banks. Maybe it's the quiet. After a busy summer we notice any return to tranquility -- even in the midst of stormy weather. Of course no one was evacuated from the island for Ernesto. But it certainly seems that there are fewer people than usual here today. Maybe everyone has just decided to hunker down until the storm completely passes us by.